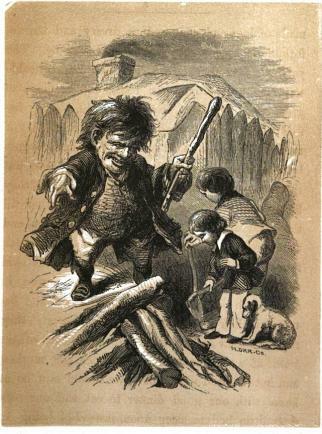 The old dwarf Moggo before a pile of wood, telling the little boys that if they did not have it all split into small faggots by the time he returned to dinner, he would put them in a pot and boil them both up. First of all, I know I’m not posting much this week. Unfortunately, I’ve had a lot to do with my day job, plus a number of other projects to work on (such as my garden). I’m hoping to be back to daily or near-daily posting again by next week, but I hope you’ll understand if I wind up with some gaps here and there. I really appreciate all of you who read our little site here. I hope it continues to be worth visiting. Now, onto the topic of the day! I was listening to Jay O’Skully’s latest podcast (check him out if you haven’t yet—he’s quite excellent), which is all about fairies. That got me to thinking about the role of fairies in the New World. My first impression was that most of what we conceive of as “fairy tales” come from Old World sources, and that any stories about the Good People on this side of the Atlantic would likely have been imported. While we certainly have our share of imported tales, I found out that we also have plenty of reason to think the Fair Folk are alive and well all around us. “The Ojibways were a great nation whom the fairies loved. Their land was the home of many spirits, and as long as they lived on the shores of the great lakes the woods in that country were full of fairies. Some of them dwelt in the moss at the roots or on the trunks of trees. Others hid beneath the mushrooms and toadstools. Some changed themselves into bright-winged butterflies or tinier insects with shining wings. This they did that they might be near the children they loved and play with them where they could see and be seen. Something about hearing a fairy accused of being “turned lawyer” just makes me smile. Okay, I’m going to stop here for now, but this is definitely not the end of this topic (though I may wait a few posts before returning to it). Let me know what you think, and if you have any fairy tales set in the areas around you which you’d like to share I’d love to hear them! This entry was posted on April 8, 2010 at 9:30 am and is filed under History & Lore. You can subscribe via RSS 2.0 feed to this post's comments. I’m fascinated by the little dance that seems to happen when we of European ancestry try to relate spiritually to the “new world” landscape around us. Can we really relate to the “faeiries” of the First Nations? Are the spirits here inextricably tied to the cultures that existed before European settlers moved in? Did European faeries move here with us? Is the “spiritual landscape” the Land of Faerie limited by our own physical geography? I tend to think that we imported many of our Fair Folk….I also think that the Land of Faerie is a realm outside of, or in between, time and space so not necessarily immediately connected to the land you and I are standing on. Also, not having a lot of exposure to the coastal first nations and knowing a few people of Coast Salish descent only in passing, I find it hard to connect to the spiritual forces that are connected to them. Even growing up in the interior of British Columbia my “spiritual” relationship with the land was influenced by native culture only when I had face to face interactions with Shuswap (Secwemic) friends–one example was when I had it explained to me that many believed that the “dust devils” that were very prevalent in that semi-arid environment were actually the physical manifestation of ancestral spirits. From that point on I related to that phenomena very differently. Anyhow, it’s a fascinating topic. Thanks for blogging about it and thanks for mentioning my podcast. At any rate, I like thinking about these different ways of looking at fairies and their world, as well as finding new ways to look at our own realms, both spiritual and geographic. Thanks so much for giving me something to think about today! Oh, and I have a very similar belief about dust devils, even the little whirly ones you sometimes see in parking lots. I always think of those as some kind of spirit and nod to acknowledge them as such. It may seem silly, but I prefer not to run the risk of annoying one of the Fair Folk, lol.